Villa avec Southwest face à la piscine. Free UK appelle. Surplombant la zone de conservation. Notre Florida 'Sunholme' est situé dans un cadre splendide, surplombant un lac de conservation. Nous sommes à la fin d'un cul-de-sac dans la communauté fermée de The Sanctuary et nous avons aucune propriété en bordure de notre côté sud. Cela vous permet de profiter du soleil toute la journée, du petit déjeuner sur la véranda de 25 'x 10' en extérieur, à la piscine de 30 'x 15' avec une terrasse couverte de 40 'x 27' Lanai regarder le coucher de soleil. La terrasse extérieure est unique dans la région et prend tout son sens pendant les mois les plus froids de l’hiver, offrant la possibilité de maximiser la chaleur du soleil d’hiver. La villa accueille pour tous vos besoins de vacances, la chambre des maîtres au rez-de-chaussée avec une grande salle de bains dispose d'un accès direct de la porte de curseur vers la terrasse de la piscine, tout comme la salle de petit déjeuner. Les 4 autres chambres sont desservies par 2 salles de bains et il ya une salle de personne supplémentaire en bas. Toutes les chambres ont des ventilateurs de plafond, tout comme la salle de jeux, le salon familial et le bureau. Toutes les chambres ont un écran plat T. Vs et la chambre principale a un 40 "HDTV. Le salon a un nouveau 55 "Smart TV afin d'apporter votre mot de passe Netflix et vous êtes tous ensemble. Les appels vers les lignes fixes du Royaume-Uni sont gratuits et illimités. Le palier à l'étage dispose d'une télévision à écran plat de 50 pouces avec une X-Box One et d'une sélection de jeux. La salle de jeux climatisée intérieure comprend une table de hockey sur glace pleine grandeur, un baby-foot, une table d'échecs et des tabourets pour des activités plus cérébrales! Il y a aussi plus de 300 livres au choix qui sauront satisfaire tous les goûts! Master Bedroom - grande salle de bains avec douche italienne et baignoire, lavabos de main jumeaux et placards jumeaux (en bas). Salle de bain 2 avec cabine de douche double (à l'étage). Salle de bain 3 avec baignoire avec douche (à l'étage). Vestiaire invités hors salons. Piscine salle de bains avec douche de la piscine à l'extérieur. Notes sur l'hébergement: Internet gratuit et WiFi haut débit. Appels locaux et interurbains gratuits téléphone. Appels gratuits vers les lignes fixes du Royaume-Uni. La piscine surplombe un lac de conversation et est très privé. La maison est à la fin de cul-de-sac. Safe fourni gratuitement. Accueil est alarmé et surveillé - communauté fermée. Dehors: Grand Sud Ouest couvert piscine privée - grande terrasse de la piscine, y compris une véranda couverte. Grand Sud face externe pont soleil (ce qui est un véritable bonus dans les mois les plus froids) de chauffage de piscine disponibles. Piscine fermée dispose de 4 chaises longues, 2 tables de patio et 8 chaises. Sun-plate-forme dispose de 2 longues et une table de patio avec 4 chaises. Buanderie: Lave-linge, sèche-linge, fer et planche à repasser. Service de nettoyage / serviettes / / Femme de ménage: Serviettes et linge de maison inclus. La propriété est entièrement nettoyé avant votre arrivée. Service de nettoyage disponible lors de votre séjour (arrangé localement avec la société de gestion - coût supplémentaire). Autre: Salle de petit déjeuner avec des sièges pour 4 personnes donnant sur la piscine. Galerie atterrissant avec 50 "TV et X-Box One. Accès Wi Fi gratuit. Salle de jeux avec baby-foot, hockey sur glace et table d'échecs. Entièrement climatisé. Chauffage de piscine disponible à un coût supplémentaire. The villa has everything you need and some more..... It is very well kept and the fixtures and fittings are spot-on. I would recommend staying here and as I'm a regular visitor to the area I will have this place at the top of my list. Helen (the owner) is superb, nothing is any trouble for her. She will keep in regular contact in the weeks before your holiday. We all enjoyed staying in your lovely villa. Hopefully not too long before we are back. superb villa with great facilities in a good location. Just returned (Aug 2017) from 2 great weeks. Villa was clean, modern, spacious and perfect for a family holiday. Facilities were excellent with TV's everywhere, a bookcase of great books to read and lots of space around the pool and decking. Could only be improved with the inclusion of B-B-Q. Would definitely recommend. Had a fantastic stay in this beautiful, spacious and comfortable home in a peaceful location. We have stayed many times at The Sanctuary, which is a very safe and well maintained gated community, but this was the best so far. We all had a great time and our only regret is that we could not stay for longer. Our granddaughters loved the pool, and the house is so convenient for visiting the theme parks and for local essential shopping. Everything we needed for our stay was provided and we would not hesitate in recommending this house to our family and friends for future holidays. A beautiful home in a perfect location, close to local amenities and 15 minutes from Disney. Our stay here was lovely, we had 2 weeks in March 2016. A very spacious 5 bed property with a beautiful pool and lovely views over the conservation area. Not over looked at all and the facilities were excellent with everything as it is described. Helen the villa owner is always at the end of an email too providing excellent service from booking to departure. Local shops included Publix, the local supermarket for every day groceries, a Chinese, McDonalds and Chili's which was an amazing meal. Although you can't book our party of 7 were seated within 20 minutes and our waiter for the night was fantastic. We had our own car hire and frequented the Disney parks. Having been before we knew the process quite well but everyone is always made so welcome with the magic of Disney. I would whole heartedly recommend this villa and Helen to other family or friends, so much so my husband has decided this is the perfect villa for when we retire!!! I will definitely be booking again with Helen in her beautiful villa, the kids loved the pool and well, we all loved everything!! Myself and my family of 3 have holidayed in numerous villas over the years and this villa is one of the best. Plenty of space, very well maintained with great bedrooms, baths and kitchen. It is not overlooked from the rear or one of its sides, its located in a cul-de-sac, so it has a great deal of privacy. 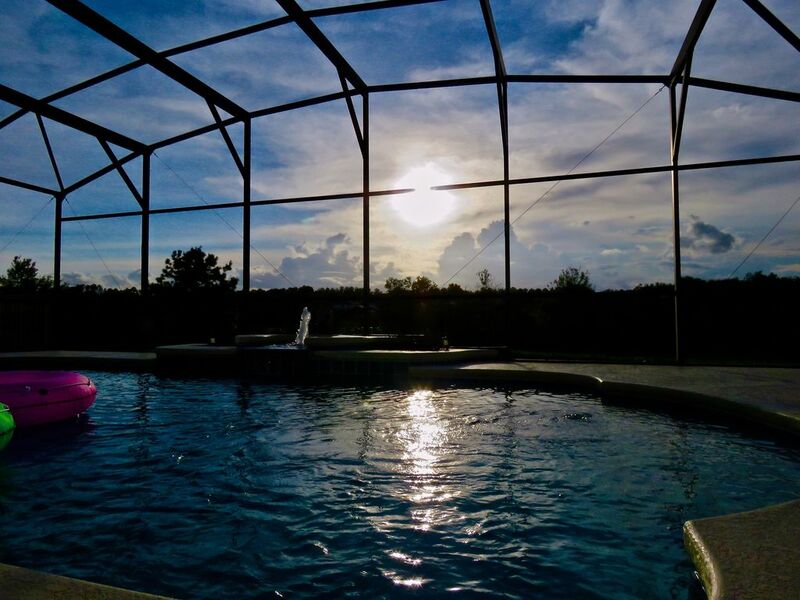 West Haven is a great community and is a perfect location to give easy access, within a short distance drive, to all the usual attractions such as the Disney Parks, Gaterland, Boggy Creek, with Sea World and Universal being only a bit further up the I4. It is also well located for places to eat and has the added convenience of the nearby Publix supermarket, at Championsgate, which is ideal for a light shop when you first arrive and haven't had chance to visit a Walmart which are cheaper (two are located nearby on Hwy 27). The Villa is located within a very well presented / kept and secure gated community, with a marvellous view of the conservation area which never gets old. The owner and the management company are both extremely professional, and helpful should you required any assistance before or during your visit. We will definitely be visiting this beautiful villa again soon and highly recommend this to any family looking for the perfect base to explore the wonders the Sunshine State has to offer. Cocoa Beach et la plage de St Pete sont tous deux à moins et heures de route. Orlando International Airport est à 35 minutes en voiture. Sanford International est de 55 minutes en voiture. Disney 10 minutes. International Drive 20 minutes. Universal Studios 30 __gVirt_NP_NNS_NNPS<__ minutes. Postner Park Shopping Mall 5 minutes. Booking Notes: A 25% deposit is required at the time of booking. Final balance due 8 weeks prior to departure. £250 security deposit required with final payment - this is returned once the Management Company confirm no damage has occurred. Changeover Day: Changeover day is flexible. Arrival is 4pm. Departure 10am. Notes on prices: Prices shown are per week in UK Pounds. Prices include all taxes and cleaning charge. Bookings of 3 consecutive weeks or more will receive a discount. Discount given for last minute bookings. Pool heat is charged at £110 per week.